Runtime: 2 hr. 29 mins. 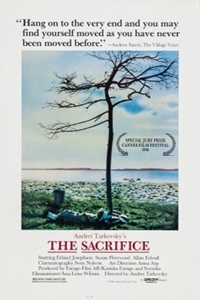 Made in Sweden in Tarkovsky's final year, The Sacrifice is a measured, compassionate view of humanity at the edge of apocalypse. Photographed by Ingmar Bergman's cinematographer in ethereal northern light, the film opens and closes with two of cinema's most breathtaking single-take sequence shots.